If you use your laptop on the go, then you would surely be concerned about the amount of battery backup it gives you. If you use your laptop connected to the power outlet 24×7, then also you should give a thought to the power consumption by your device, at the end you are going to pay the electricity bills. What Is Power Efficiency Diagnostics Report? It is a report that is generated by Windows 7 and Windows 8, that gives you detailed information about the things that are causing your device to consume more power. It will list the information in three sub-parts, namely Errors, Warnings and Information. Errors (highlighted in red) are the problems that are the main reason behind the high power consumption by your device. Warnings (highlighted in yellow) are the next things you need to solve to get a better battery backup. Information (not highlighted) are items only for for information. They don’t need your attention. Open Command Prompt as an administrator. 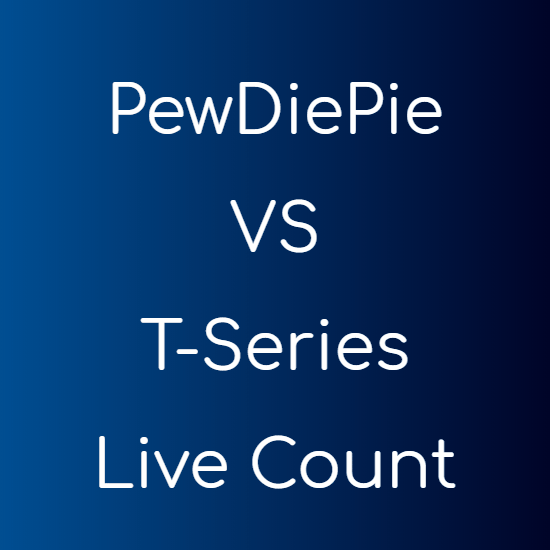 Here’s how you can do that. Navigate to the directory you want the power efficiency report to be saved in. If you want to save it in the Windows installation drive (usually C:), then you can use the command “cd..“. The report will be saved in an HTML file with the name “energy-report.html“. 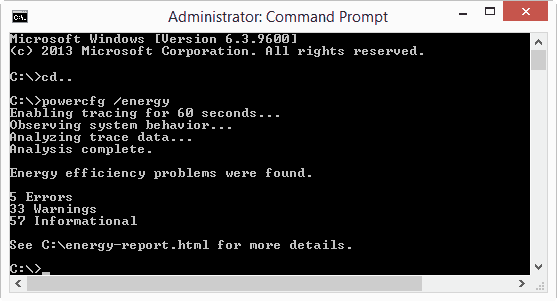 Now type “powercfg /energy” command in the Command Prompt and hit the Enter key. Below is a screenshot that shows exactly how everything will proceed. Your system will take 60 seconds to analyse the problems and generate the report. You can see the report once your system completes building it. It will give you the detailed summary of everything that’s causing your system to drain more battery. But it won’t tell you the ways how you can rectify the problem. And for that you can always see our guide to saving battery on your laptop. 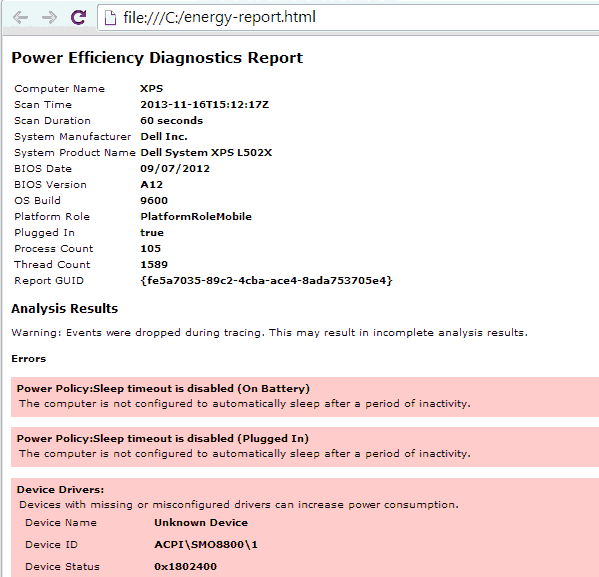 The above screenshot shows a part of my laptop’s power efficiency report. Only the errors are visible in the screenshot. Now you can easily search the solution to the error you find here, but using our own tips will be a great help.